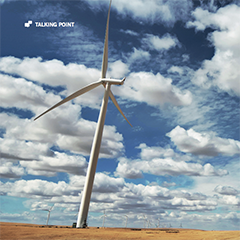 The Global Wind Energy Council released its annual market statistics on 14 February from Brussels. The 2017 market remained above 50 GW, with Europe, India and the offshore sector having record years. Chinese installations were down slightly – ‘only’ 19.5 GW – but the rest of the world made up for most of that. Total installations in 2017 were 52,573 MW, bringing the global total to 539,581 MW. The annual market was in fact down 3.8% on 2016’s 54,642 MW; and the cumulative total is up 11% over 2016’s year-end total of 487,657 MW. The offshore segment had a record year with 4,331 MW of installations, an 87% increase on the 2016 market, bringing total global installations to 18,814 MW, representing a 30% increase in cumulative capacity globally. Offshore is still less than 10% of the global annual market, and represents only about 3.5% of cumulative installed capacity, but it’s growing quickly. Beyond the statistics, however, is the fact that wind power is in a rapid transition to becoming a fully commercialised, unsubsidised technology; successfully competing in the marketplace against heavily subsidised fossil and nuclear incumbents. The transition to fully commercial market-based operation has meant that the industry is going through a period of adjustment and consolidation, and governments have left policy ‘gaps’ in some countries. The global 2017 numbers reflect that, as will installations in 2018. Cratering prices for both onshore and offshore wind continue to surprise. Markets in such diverse locations as Morocco, India, Mexico and Canada range in the area of $US 0.03/kwh, with a recent Mexican tender coming in with prices below $US 0.02. Meanwhile, offshore wind had its first ‘subsidy-free’ tender in Germany in 2017, with tenders for more than 1 GW of new offshore capacity receiving no more than the wholesale price of electricity. Overall, offshore prices for projects to be completed in the next 5 years or so are half of what they were for the last five years; and this trend is likely to continue.